Charles William ″C.W.″ Alcock (2 December 1842 – 26 February 1907) was an influential English sportsman and administrator. He was a major instigator in the development of both international football and cricket, as well as being the creator of the FA Cup. Charles William Alcock born here in 1842. 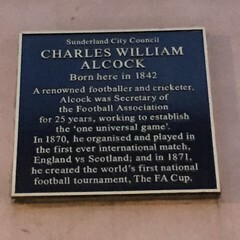 A renowned footballer and cricketer, Alcock was Secretary of the Football Association for 25 years, working to establish the 'one universal game'. In 1870, he organised and played in the first ever international match, England vs Scotland; and in 1871, he created the world's first national football tournament, The FA Cup.